When it comes to our mattresses, we can’t afford to be misinformed. In fact, of all the things we take for granted that we should be putting a lot more consideration into, our quality of sleep should rank among the highest. Sleep is an essential component of our physical and mental health; if our quality of sleep suffers, so too will our bodies (hello there, back and neck pain) and brains. For that reason, it’s worth taking the time to learn the facts about mattresses. Comfort is the main factor people look for in mattresses, but in reality, they do a lot more for us than that. Consider these common myths about mattresses, and keep them in mind when you’re looking to revamp your sleep setup. 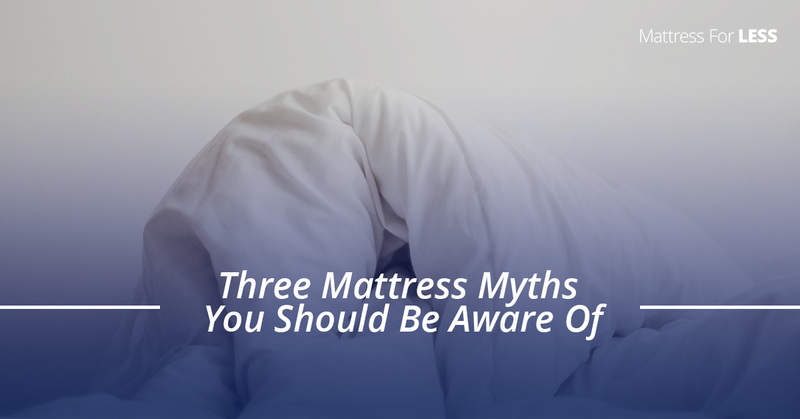 The most common version of this myth is the assertion that harder, firmer mattresses are best for the human body. But there are other variations of it—soft pillowy mattresses, memory foam mattresses, and so on. If there’s a type of mattress, there’s probably someone out there arguing that it’s the end-all be-all of mattresses. In reality, every person is different and the ideal mattress will likely be different between two people. There are a variety of factors that should be considered when you’re mattress shopping—your typical sleeping positions, whether or not you’re sharing the bed, current body pains, and more. For many people, a hard firm mattress may be ideal, but at the end of the day, it’s important to remember that there’s no one size fits all solution for mattresses. There are plenty of reasons to replace a mattress—a spring breaks, holes start forming, it becomes lumpy, etc. The thing is, all of those things are obvious. What a lot of people don’t know is that there are reasons to replace your mattress that aren’t so obvious. In fact, most most mattresses only have a useful life of about seven or eight years. Once you hit that point, it’s probably good to start shopping around, even if there’s nothing that’s visibly wrong. The strength and support of mattresses wear down over time, and they also become a host to years’ worth of fluids, shedded skin, and all other manner of unpleasant, unnoticed leftovers from the human body, even when they’re regularly washed. After eight years or so, start shopping. This one is a little misleading, because it depends on the way you interpret “comfort.” When it comes to mattresses, there are two types of comfort—short-term and long-term. Your long-term comfort is what’s important when you’re mattress shopping. In other words, just because something feels more comfortable right away, doesn’t mean it’s actually the best choice for you. In fact, a lot of furniture that is extremely comfortable actually wreaks havoc on your body with extended use. Let’s consider an example. When you jump into a giant bean bag, or perhaps a wonderful nest of fluffy soft pillows, it’s super cozy and comfy and feels immediately comforting. But, stay there for long, and the uneven shape of the setup will start to take tolls on your body. It’s comfy at first, but after some use, it shows its true colors. It’s the same with mattresses. It’s good to listen to the experts when they recommend mattresses that are ideal for you, because sometimes a mattress that’s less comfy up-front will actually end up leaving you more well-rested, and your back and muscles will thank you for it. Quality sleep is something that every person in the entire world has a need of. There are zero exceptions. At Mattress For LESS, we can’t help the whole world with their sleeping needs, but we sure can help the people of Connecticut! For years, we’ve been helping the folks of Newington, Wallingford, and Waterbury to find the mattress that’s right for them. Please take the time to learn the facts about mattresses; your sleep and quality of life will greatly improve if you do. Those are both things that we want to help you with at Mattress For LESS, and in addition to helping elucidate the falsehoods of mattresses, we will take all the time in the world to serve your needs and provide you with the product that is truly ideal for your needs. Looking for a new mattress? Stop by Mattress for LESS today, or contact us if you have any questions! Same Day Delivery Or Pickup!